Following extensive research, it appears that there is great demand for a monthly Cheese Ale & Wine night at The Local, 40a High Street, Markyate. 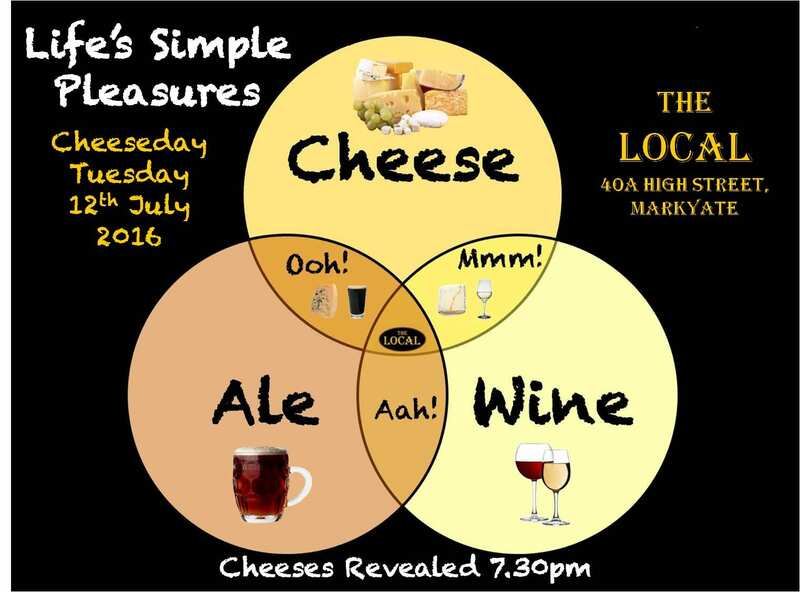 So our first event will be on Cheeseday (Tuesday – geddit?!) 12th July at 7.30pm, where an extensive array of cheeses (plus pickles and crackers) will be sampled by all, alongside wines, ciders and great local beers, fresh from the cask. Those attending are asked to bring 200g of the cheese of their own choice (the more obscure the better! ), plus £1 to help towards the cost of crackers and pickles. All the cheeses will be pooled and shared for everyone to enjoy. The greater the numbers, the better the choice of cheeses on show! Those bringing common-or-garden cheddar, BabyBel, Cheese Triangles, or Cheese-Straws will be ‘outed’ as cheapskates (or cheese-skates!) and banished to drink lager somewhere else! It would help us if you could bring the cheese to us either the day before or by 6.30pm on Cheeseday to give us enough time to set up in good time. We will collate a list of all the cheeses displayed and hope to grow this every month. We plan to run this on the second Cheeseday of every month. We look forward to seeing you on the 12th, if not before. Here’s to a great evening!